Originating in the Green Swamp, the Hillsborough is a blackwater river and largely spring fed by the waters of Crystal Springs (south of Zephyrhills), accounting for its clarity—even after a hard rain. Along its 54-mile journey, several tributaries feed into it before it empties into the Tampa Bay. Throughout the years, this river has had several names, but it was finally named Hillsborough River by the British in 1769 after the Earl of Hillsborough who served as colonial secretary of state (Boning). On this Sunday morning, I rented a sit-inside kayak from the Canoe Escape outfitters and was dropped at Sargeant Park, where I had an option of paddling two hours downstream to Morris Bridge Park or four hours to Trout Creek Park. I opted for the four-hour paddle, and was rewarded with a journey through a river wonderland. This river was absolutely beautiful—an A+–with water often clear enough for me to see not only the eel grass swaying along the sandy bottom, but many bass, gar, and sucker fish as well. And there were many, many alligators. Within my first 30 minutes on the river, I had already sighted 20 gators. It appears that alligators are to the Hillsborough what turtles are to the Santa Fe. By the end of my paddle, I had seen somewhere between 50 and 100. It was obvious that these gators were at home in their habitat, and although they were not aggressive, they weren’t moving from their favorite spot just because I was there, either. Beautiful, serene, and wild. My paddle was—AWEsome. I was in the midst of a bird paradise with a sweet symphony playing in the trees as the water pulled me gently along like a ride at Disney. A great egret turned toward me, looking silly with white sand on the end of his bill, having just dug for some treasure. A momma limpkin enjoyed a day at the river with her two young ones. Anhingas spread their wings to dry them in the sun. Egrets, herons, limpkins, roseate spoonbills, woodpeckers, wood storks, and ibis were plentiful. At one point in the journey, I passed Nature’s Classroom, and hundreds of vultures, seemingly wicked as they flapped their wings and congregated along the bank, took it all in. The river was shaded, canopied for much of the trip by oaks, red maples, cypress, and an occasional sweetgum. At times, the river was narrow and twisted and turned. (I thought I had made a wrong turn at one point.) When the river widened, water lilies and hyacinths decorated its edges. It was impossible to see it all. Watching a gator slither into the water to my left, I heard a huge splash to my right and turned just as an osprey lifted himself from the water. An otter frolicked in the water, finally emerging with his hair slicked back, looking ready to don his smoking jacket. The harmony and balance of nature amazed me. I paddled just two small sections of this river, but there is so much more to it. Other sections include a six-mile run from Crystal Springs to Hillsborough State Park (not for the beginner; there are three Class II drops/rapids and many portages in this section.) The section from Hillsborough State Park to Sargeant Part where I put in, contains the Seventeen Runs with numerous deadfalls and carryovers. At this time of year with the low water levels, the Seventeen Runs section is closed. However, for anyone interested, Canoe Escape takes a group out once a year in September. Another beautiful Florida river, the Hillsborough is a wonderfully and surprisingly scenic and serene escape. Wow, Susan, you captured the spirit of your adventure on that stretch of the Hillsborough really well. Much appreciate your observations/chronicles of the birds and animals you saw. The description of the otter was priceless. My experiences on the Hillsborough when we did our USF field trips were downstream near the urban territory of Tampa Bay, and they were far more tame than yours. Would be neat to paddle that Class II water—when the river is up. Thanks, Bill! You would love this part of the river. I don’t know which I liked more–the Ocklawaha or the Hillsborough. There were more paddlers on this river, but we were far enough apart, that I could still pretend that I was alone in the wild-ness. I would love to paddle the Hillsborough with you sometime! I’ve yaked quite a few rivers in FL, but never this one. Now that I live so close, it has to move up my to do list. 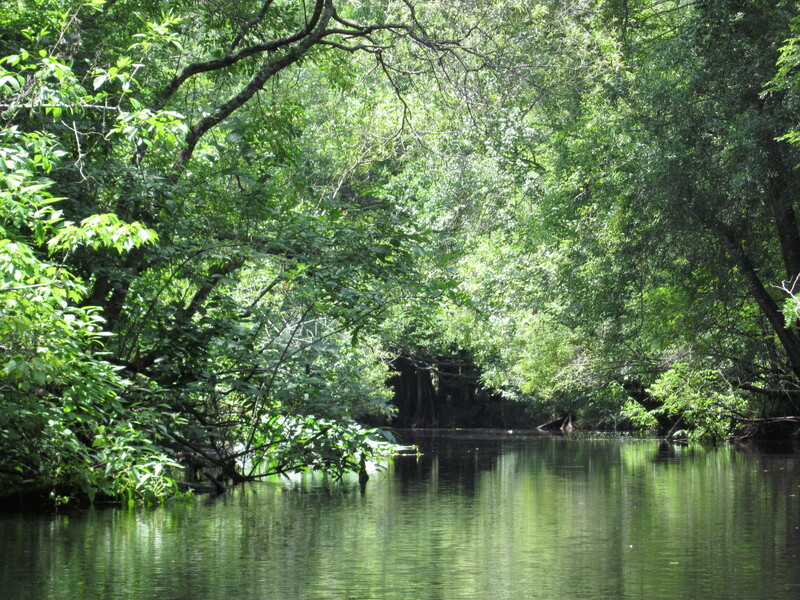 Is the Suwannee your favorite of those you’ve paddled?